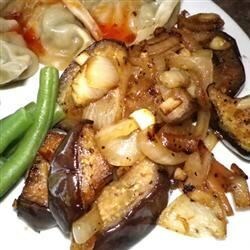 "Stir-fried eggplant with onion in a delicious spicy sauce. Serve over hot cooked rice." Heat 2 tablespoons of oil in a large skillet or wok over medium-high heat until almost smoking. Cook and stir the eggplant cubes until they begin to brown, 3 to 5 minutes. Remove the eggplant with a slotted spoon, and set aside. Heat 2 more tablespoons of oil in the skillet over medium-high heat, and cook and stir the onions just until they begin to soften, about 30 seconds. Stir in the garlic, and cook and stir an additional 30 seconds. Mix in the soy sauce, water, oyster sauce, chili garlic sauce, sugar, and black pepper, and stir to form a smooth sauce. Return the eggplant to the skillet, lower the heat, and allow the vegetables and sauce to simmer until the eggplant is tender and almost all the liquid has been absorbed, about 5 minutes. Drizzle sesame oil over the dish, and give one final brief stir to combine. See how to make mini lamb balls in a spicy tomato and eggplant sauce. Adding a small amount of chicken or pork can be done if you need the extra protein, but definitely is not necessary for the taste. Reduce chili paste a bit if you find the dish too spicy for your taste. Made this exactly following the recipe, but added chicken that I had marinated in garlic and soy sauce and pan seared. It was super tasty served over jasmine rice. I loved this. I find eggplant is best when the texture is almost mushy so I doubled the cooking time and the results were delicious.